The biocompatible N52 magnet previously available on DangerousThings is no longer available. Does any have any information regarding this? What are some of the current suppliers now that DangerousThings is unavailable? Amal posted a video last week about this, explaining how he doesn't believe any magnets currently available are safe for implantation. I don't know if there is a good 'current supplier' for magnets. The determinations of TiN's weaknesses as a coating is a good thing to understand, for sure, but it's a bit of an annoyance on the scale of being practically useful, on it's own. 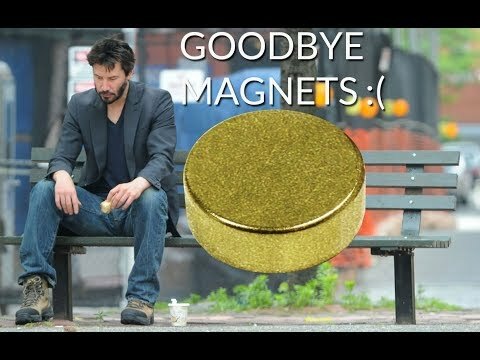 I don't personally think there 'aren't any' good magnets, Just.. there aren't any good permanent magnet choices.. There's plenty of short-term successes, looking about, but the suppliers are either vague, out of stock, or trying to develop new stock. I personally have interests in studying how to do things with Diamond, but that isn't on my radar or lists due to funding capacity to play with. Diamond is a fascinating idea, but not feasible. It would be massively expensive material wise, then there's the insanely difficult production to factor in... And on top of that diamond will be even more difficult than TiN in regards to the tiny molecular imperfections that he mentioned. diamond sounds nice in theory. you can grow it using microwave heated gas to create a plasma. Temperature wise i'm not sure but that's not the issue with diamond. biggest problem is, you get a very rough polycrystaline diamond surface. this stuff is virtually impossible to work with. you'll get hard crystal orientations every time. Polishing these things would take ages and would only be possible with dusted diamonds. Cutting it is only possible using lasers. The only other thing you can do it is smash'n crash it with a hammer. Everything else will fail. File, abrasives, saws,... no matter what you'll kill your tool. anyway, we still could use a thin metal shell and laserweld it shut, maybe even a few grains of silica-gel or simmilar to deal with whatever moisture creeps in. One that's considerably bigger than a thin coating but still thin compared to a big silicone coating. @thomasegi you would need to micro scale the hell out of it, but I think if you used an ultrafine slurry of diamond dust as an abrasive on a flat surface, you could over a long period polish a rough surface flat, right? This is a spitball of an idea, but would that work? also, is there any way to 'break' diamond with ultrasonic or controlled vibrations to help shape it similar to cutting glass or ceramics? @zerbula, yes polishing with diamond dust works but it literally takes monthes to wear down the surface even a tiny bit. it's pretty much the hardest thing you can do, sort of literally. the process i am aware of produces about palm-sized diamond disks and they require multi-kW magnetrons to keep the plasma going. so i guess batch coating would be possible but the whole setup is a bit difficult. Idea: Crystals grow in fluids. Gaseous or liquid. Some crystals grow in a solution, such as rock candies. Some grow because of a solutions with specific conditions, because of outside conditions, such as gravity or (I'm guessing the lack of) relative pressure, IN a solution of something else, that may or may not be relevant, such as air and with mineral deposits in caves, in the case of stalagmites. Graphene is far simpler than a diamond coating, and due to the lattice structure will run into the same problems as diamond but far less severely due to it's tiny size and lower tensile strength, manufacturing requires less expensive equipment. It's also far cheaper material wise and manufacturing wise. We effectively have the base we need, a nanotube. However this graphene tube isn't fully closed off, and I have yet to see someone attempt to do a fully enclosed cylinder or disk. Graphene is notorious for it's manufacturing process, and it's typically built on a substrate which would make a fully bonded disk very difficult. IIRC, Graphene is extremely 'tough' for its thickness, very resistant to punctures or tearing. it is still flexible and extremely thin. This sounds pretty ideal, maybe here is where Au may have a place as a filler.. maybe.. probably not. I'm glad you mentioned both of those things. I still have 2 segments of graphite in my palm, and hasn't migrated at all in over 5 years or rejected, although that's not the proper term in this instance. Graphite alone is biocompatible, graphene far more so as the goal is to have all the carbon atoms bonded in a perfect lattice structure keeping it from splintering like graphite does. You're talking about electron/quantum tunneling, and that's only a concern with particles themselves and certainly not entire molecules, especially ones as advanced as an H2O molecule. Quantum tunneling very well may occur, but the problem there would be it adding to galvanic corrosion which is a problem from ambient electrolytic compounds anyways. "For it to be true gaphene then* it's a single..."
Grains, when awkwardly laid next to each other, leave open space around the grains boundary. I can see you obviously already know that, but to answer your question it would be logical that smaller grains would leave smaller open space, but also logically far more of them. This is why i've recommended doing 2 seperate coatings (even if it's the same material, Ti in this case) because statistically that would drastically reduce the chance of one of these spaces reaching all the way to the magnet, despite there being more of them with smaller grains the over all open area will be smaller. Smaller grain seems better, at least according to my headcannon, but let's not take away any options yet. I've said this phrase a lot on this forum recently, but this is another case of pick your poison as we continue with trail and error. I won't create a perfect magnet, you won't either unfortunately and it's entirely possible that a perfect magnet is unobtainable with modern day resources. Even pacemakers are stagnated by the same problems these magnets are and there's billions of dollars worth of interest in them. I'm going to start doing another batch of magnets soon, i'll open a separate thread for it in the next few weeks. Please continue down this path of questioning, it's a relatively hardly understood barrier for these implants and any research will have widespread implications for every implant. Message me if you'd like to start doing some experiments regarding this in particular with me as i'll be doing a lot of my own before I open the next batch thread, any and all help is appreciated. Does anybody reading this have any materials and other proper equipment? If you don't have an adequate microscope to see how we can work on properly aligning the grains you can send small samples my way, and if you do but don't have materials i'll have plenty of samples I could use help viewing and cataloging. @Cassox I know in the past you've had access to a microscope and if I remember right approximately 1500 times resolution, which is about 200 higher than mine. I'll contact you through messaging later to talk about this in depth, but I figured i'd @ you so you can catch up. Long story short i'd like to send you any promising samples so you can view them a bit more indepth so we can refine the solidification process of various coatings under different conditions and varying procedures. This is off topic for the thread and already long enough, so this is the last thing I promise: I've recently purchased some Ti, TiN, a small amount of Au, and i'm about to purchase many different types of epoxies/resins. This is already fairly expensive, which is the main reason i'm trying to include more people in this community on my research. These coatings are not going to be put on a magnet yet, and as such I can't sell anything to make up the loss. This is the kind of thing we should all be participating in, as information is powerful and this kind of resource will be useful in almost all projects. If this gets enough community participation to be as extensive as i'd like i'll speak with Telknir to see about getting this added to the wiki, and revamping a few things myself but that's enough off topic statements for now. As for the original kind of off topic discussion, I will be doing more research into graphene and i'll play around with making some. But like I mentioned far up in the thread we are likely far away from successfully doing graphene, diamond, or a combination.